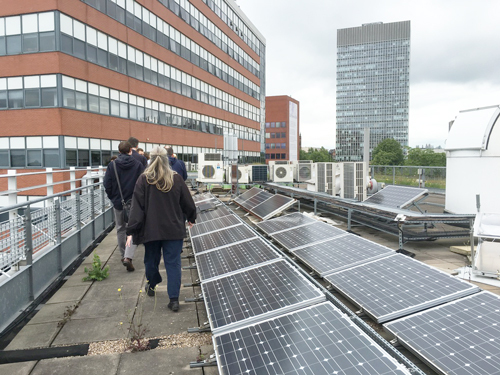 Visitors to the University of Sheffield were taken on a guided tour of the campus as part of EU Sustainable Energy Week. The Sustainable Energy Walking Tour was organised by the Grantham Centre for Sustainable Futures and research centre Energy2050. On Friday, Grantham Research Fellow Christian Unger took visitors to the University’s roof top solar farm, anaerobic digestion lab and battery lab. 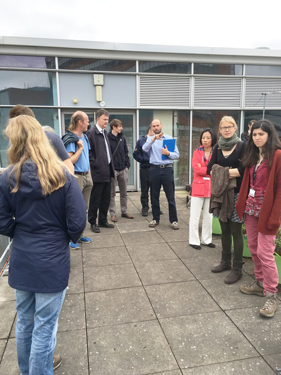 The facilities demonstrated some of the research taking place in Sheffield to solve sustainability challenges. Aldous Everard from Sheffield Solar tells guests on the walking tour about the Centre’s work. Walking tour guests visit the Solar Farm at the University of Sheffield as part of EU Sustainable Energy Week.